The propert is very very very beautiful, right on the water. We upgraded and got an ocean view and it was amazing. However, this place is a little out of the craziness which is good you just have to be ok with walking a bit to get into town. Not too happy about having to pay for ice to be delivered to the room. And the restaurant menus were too pricey. A place called La Grita looked good but compared to prices in town was really expensive even for US hotel prices. Nice hotel close to beach with excellent amenities. Beautiful hotel tucked just to the side of the craziness of Phuket. Hotel was great and service excellent. Our experience exceeded every expectation. The grounds are very well kept, staff was incredibly friendly and helpful, and close enough to walk to the town of Patong but just removed enough to have quiet privacy. Will definitely stay here again. All we could ask for. Perfect views, lots pools, and good food. Most of all, quiet. No other words but amazing! The staff and service was outstanding. The restaurants, bars, and pools were outstanding as well. And you can't get a better view!! When we first checked in our room was in the outdated section of the hotel and very dirty. When we made the front desk aware of the situation they took care of us and gave us a much better room. Our stay ended up being excellent other than this minor hiccup at the beginning. Beautiful views and great food! Beautiful, contemporary hotel with all the modern conveniences. Gorgeous setting, up from the Patong craziness. Get your walking shoes on, because the stairs will be a workout. Multiple pools, restaurants and bars. Delightful staff and service. Would recommend. What I liked: - the hotel's quiet location, away from the hustle and bustle of Patong beach; - friendly and helpful staff; - variety of meals at their breakfasts; - nice sea view from the room. What I didn't like: - the sand underneath the sea water is very rocky and has lots of corals. Thus, it is a bit dangerous to swim since you can get cut - especially during the low tides. The hotel has a jetty, however, the swimming area around it is rather limited. Also, the jetty's ladder does not go deep enough into the water, which makes the process of getting out of the water somewhat uncomfortable (considering the low tides and the fact that the ladder is sharp and slippery); - the TV set in my room was somewhat old and small, and the DVD player's image quality was poor; - pesky mosquitos in the lobby area (the hotel offers free WiFi there if you bring your laptop - and complimentary mosquitos :-)); - the bathroom is relatively small. Patong Beach is within a 5-minute walk of Amari Phuket while other popular sites like Jungceylon Shopping Center are within a mile (2 km). This 380-room, 4.5-star resort welcomes business and leisure travelers with 3 outdoor pools, a full-service spa, and 2 restaurants. Enjoy dining at the resort's 2 onsite restaurants: Rim Talay specializes in international cuisine and serves breakfast, brunch, lunch, and dinner; La Gritta offers relaxing ocean views. Satisfy your hunger without leaving your room with 24-hour room service, or quench your thirst with a beverage at the bar/lounge or coffee shop/café. Start each morning with buffet breakfast, available for a fee from 6:30 AM to 10:30 AM. A TV comes with satellite channels and pay movies, and guests can stay connected with free WiFi. The bathroom offers hair dryers, free toiletries, and slippers. Other standard amenities include a minibar, a coffee maker, and free bottled water. Guests of Amari Phuket have access to a full-service spa, 3 outdoor pools, and a children's pool. There's free parking and a free area shuttle. Multilingual staff at the front desk are standing by 24/7 to help with tours or tickets, dry cleaning/laundry, and securing valuables. Other amenities at this beach resort include a fitness center, a spa tub, and a sauna. 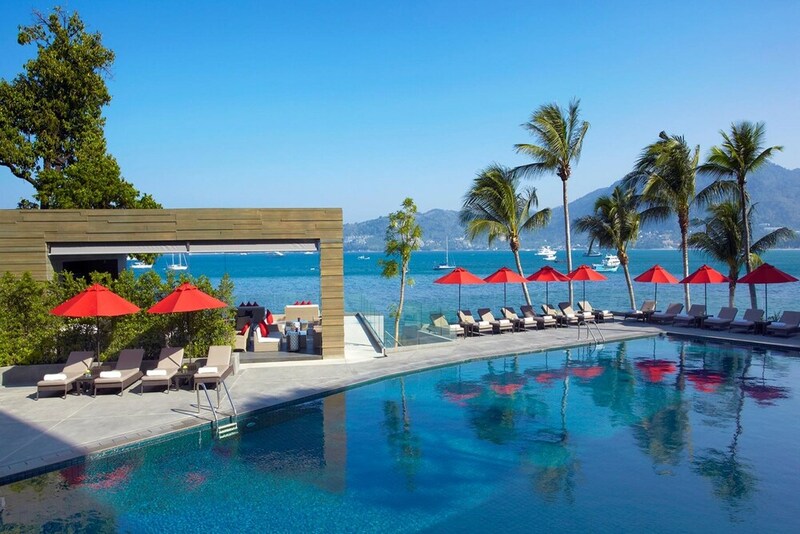 Rim Talay - Poolside restaurant and bar specializing in international cuisine. Open for breakfast, brunch, lunch, and dinner. Alfresco dining available (weather permitting). Kid's menu available. La Gritta - Ocean-view restaurant specializing in Italian cuisine and serving dinner. The resort has 3 outdoor swimming pools and a children's pool. A spa tub, a sauna, and a fitness center are other recreation options. The preferred airport is Phuket (HKT-Phuket Intl. ): 35-min drive, 22.5 mi/36.2 km. The minimum check-in age for Spring Break is 15 years old. Book a stay in a Club Suite, 1 Bedroom, Balcony (Ocean) or a Club Suite, 2 Bedrooms, Balcony (Ocean) room type and receive access to the Clubhouse with tea, coffee, and snacks all day; cocktail hour in the evening; private dining and lounge area with a la carte dining (surcharge); buggy service to main hotel lobby and swimming pools. Children must be accompanied by adults at all times. Dress code for Clubhouse is smart casual when using the lounge. Must book a stay in a Club Suite, 1 Bedroom, Balcony (Ocean) or a Club Suite, 2 Bedrooms, Balcony (Ocean) room type to receive benefits. Full details at check-in. Offer subject to availability. Offer is not valid with groups/conventions and may not be combined with other promotional offers. Other restrictions and blackout dates may apply.